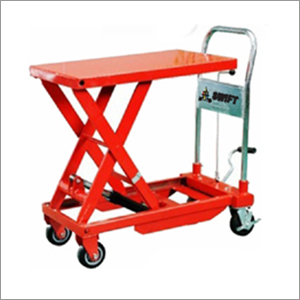 We are a manufacturer of hydraulic hand table truck, which is fabricated in chorus with the ergonomic concepts in lifting, loading, palletizing, and unloading. It has high performance DC motor along with push buttons for raising / lowering the lift. Mainly the frames are made fully of steel and have a powder coated finishing which directly augments its protection as well as durability. The international economy is volatile and can go downside at any level. In such scenario, controlling cost factors and maintaining quality are extremely important. Repeated purchasing of material handling equipment results in elevated costs; hence, this factor should be reduced by smart purchasing of equipment like hydraulic pallet truck only once. Our 2 models have battery chargers, which are perfect for rapid charging. Also, the side door design of this product makes its very easy to maintain for a longer run.